Founded in 1969, ZD Wines is owned and operated by the deLeuze Family. The winery is located in Rutherford, a premium Cabernet Sauvignon growing region in the heart of the Napa Valley. 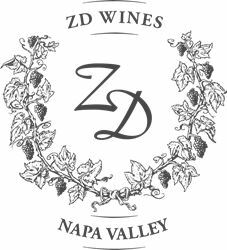 ZD Wines is a family business that is committed to producing world-class wines, farming organically and providing first-class hospitality to guests, all while supporting many charitable efforts locally and throughout the country. This year they celebrate 50 years of winemaking, with the second and third generations of the deLeuze family carrying on the family legacy. Visiting ZD Wines in Rutherford is a top-notch Napa Valley experience. ZD’s world-class wines, hospitable staff and amazing views are among the best in the Napa Valley. In celebration of their 50th anniversary, ZD recently finished the renovation of their hospitality center that features a sleek, modern design with glass walls that create unobstructed views of the valley floor. The tasting room features floor-to-ceiling windows and sliding doors that create an indoor/outdoor space that provides the ultimate in luxury wine tasting and relaxation. ZD Wines is open daily from 10am – 4pm. Reservations for the Vineyard View Tasting are highly recommended and required for all enhanced tours and tastings or parties of 6 or more. Please e-mail experiences@zdwines.com or call 800.487.7757 to book. Visiting ZD Wines in Rutherford is a top-notch Napa Valley experience. ZD’s world-class wines, hospitable staff, and amazing views are among the best in the Napa Valley. As ZD celebrates 50 Years, the hospitality areas of their Rutherford winery are currently undergoing a complete renovation. The winery welcomes visitors 7 days a week from 10:00 a.m. to 4:00 p.m. for the UnWined Tasting. In addition, special tour experiences are available by appointment, including our Vineyard View Tour & Tasting, Eco Vineyard Tour, Library Selection Tasting and private group tastings. The ZD website provides more detailed information about each of these options at www.zdwines.com, or call 800-487-7757. View from Tasting Room: Vineyard View Tour (by appointment) Enjoy a selection of our Reserve wines in crystal stemware from your table in our Vineyard View Room or on our deck overlooking the vineyards of Rutherford. Wine Education: Wine-savvy Tasting Room staff. Knowledgeable, friendly, and down to earth. To join the wine club, visit www.zdwines.com or call 707-963-5188. First Taste was created with you in mind. Customize your membership by choosing only the scheduled shipments of ZD wines you would like to receive prior to its release to the general public. Whether you like only reds, whites, or select varietals, you are in control of what to select and enjoy! Club discounts are benefits, along with member pricing for winery events. There is no cost to join. For more information, call 800-487-7757, email FT@zdwines.com, or visit our website at www.zdwines.com. 15% discount on bottles of select current release wines. ZD Wines is certified under the Napa Green Winery Program by the Napa County Department of Environmental Management (DEM) and the Association of Bay Area Government’s (ABAG) Green Business Program and completed all the regulatory components needed for environmental sustainability. These components included developing water and energy conservation methods, preventing pollution, and reducing solid waste. In addition to developing sustainable winery practices, this program is set to become the standard for the state of California. ZD Wines is certified under the Napa Green Certified Land Program. ZD Wines has created and implemented a customized farm plan with measured results that addressed all aspects of its property, vineyard land as well as non-farmed land, including practicing soil conservation, water conservation, stable drainage, riparian corridor enhancement, fisheries and wildlife habitat enhancement and long-term improvement and sustainability.